Offline Sales Event ­ - In anticipation of B1A4’s Special fan meeting in Kuala Lumpur, TGM Events and Acer Malaysia will be holding a two­ day Offline Sales Event on January 3rd­ - 4th, 2015, at OW:L Espresso @ SS15, from 10AM to 6PM. At this event, fans will be able to purchase tickets for the fanmeeting to be held on January 10th, 2015 at KL Live. Fans who have already purchased tickets may also attend the Offline Sales Event to pick up their tickets or their Acer Liquid Jade smartphones, which will be provided, free of charge, to all VVIP ticket holders. TGM Events and Acer Malaysia will also be giving away one (1) Acer Liquid Jade smartphone and VIP tickets to B1A4’s Special fan meeting in Kuala Lumpur during the Offline Sales Event. Directions on how to enter these giveaways will be given at the Offline Sales Event itself. Tickets are still available for online purchase at http://tgmevents.tictail.com. Here is a great news for dear BANAs! 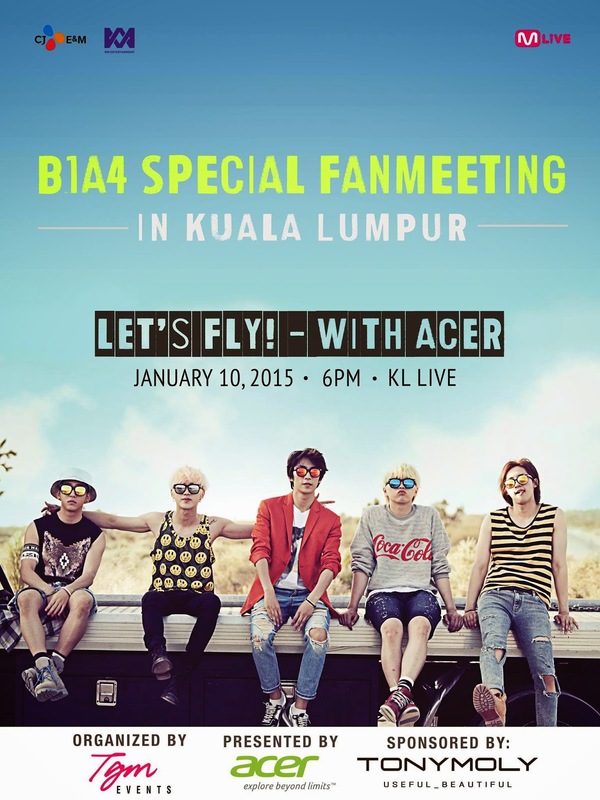 KloseUP is giving away two (2) General Admission standard tickets to catch 'Let's Fly with B1A4 & Acer' Special Fan Meeting in Kuala Lumpur on 10th January 2014! Check out our Facebook page for further information.